Rare 3 Bed. Unit w/ Ocean View- Central AC- Ground floor- 5 min. Walk to Beach! This is an elegant island-style 3 bedroom, 2 bath, deluxe end unit suite. It is located on the ground floor with partial ocean view and 2 lanais with secluded lawn areas that feel much like having your own backyard. There is an enlarged dual shower in the guest bathroom. Best of all, this beautiful beach condo has separately-zoned Air Conditioning systems in the living room and all three bedrooms. This rare single floor 3 bedroom unit has beautiful 18X18 tiles throughout the entire unit. Granite counter tops in the kitchen. A beautiful custom built vanity in the hallway bathroom, with custom built fixtures. There is a king bed in the master bedroom, a king bed in the second bedroom, and a bunk bed in the 3rd bedroom. The bunk bed can sleep up to four. It has a twin bed on the top bunk, a full-size bed on the bottom, and a twin trundle drawer bed that can be completely pulled-out. ---The full size bottom bunk has premium 11' mattress. * Individual adjust Air-conditioning in the living room and all bedrooms. * Dual shower in the guest bathroom. * Our home-away-from-home is well stocked to satisfy all your vacation needs. 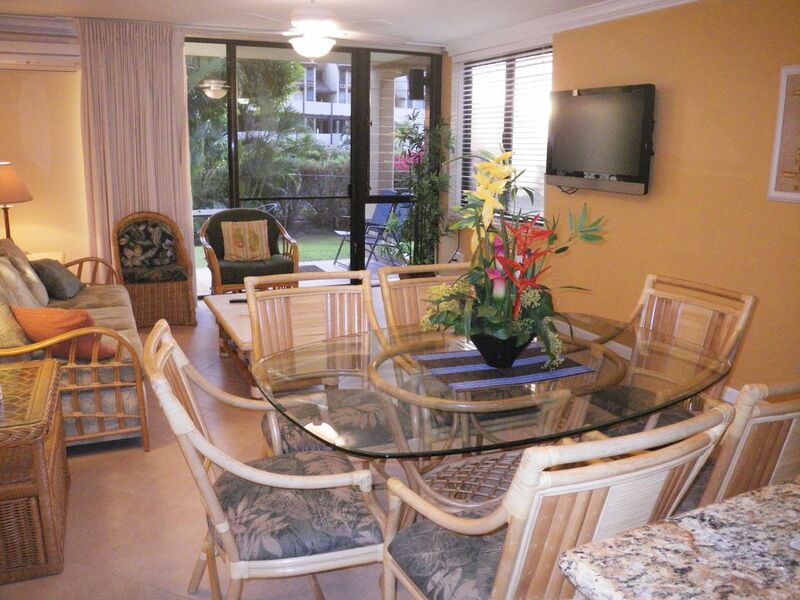 Kamaole Sands is one of the most popular resort condo complexes in South Maui. Nestled in 15 acres of tropical gardens surrounded by beautifully maintained lush green lawns, fountains, waterfalls, and fish ponds, is one of the largest swimming pools in Kihei, a children's wading pool, and 2 Jacuzzis. The grounds also includes 4 tennis courts, and 9 BBQ gas grill areas are conveniently located throughout the complex. Truly, what makes Kamaole Sands so desirable is the LOCATION. Kamaole Sands is directly across the street from Kamaole III beach and beach park. Kamaole III is one of the nicest sandy beaches on Maui, popular with locals and tourists alike. This beach is great for swimming, boogie boarding, snorkeling, sun worshiping, and whale watching (in season.) The large Kamaole III beach park is beautiful, clean, and well maintained, and is complete with facilities, outdoor showers, and children's playgrounds. Its huge grassy area is perfect for all kinds of sports, and for enjoying the beautiful Maui sunset. There are many restaurants within walking distance, and just a short drive away is the town of Wailea and golf courses. *Cancellations received 60 days prior to arrival (90 days for winter holiday) will be refunded less the $100 cancellation fee. *No refund on cancellations received within 60 days of arrival (90 days for winter holiday). Guest bathroom has duo shower. Air Conditioning in Living room, and all three bedrooms. Great condo for our family holiday!! We were very pleased with the condo, it's location to the beach and walking distance to restaurants and shops along South Kihei Drive is awesome. The condo was very spacious for our family of 6 adults and 2 eight month old granddaughters. The green space adjacent to our lanai felt like our own backyard. The kitchen and bbq area allowed us to have family meals after the little ones were dreaming of the waves and sandy beaches!!! We had a great two weeks with our family..... Thank you again!! Aloha an Mahalo.....Enjoy the sunsets!!!! A great condo. Location and beach supplies perfect. Great condo for a multi generational family vacation. Lots of room for everyone. The beds were really comfortable and having two bedrooms with king size beds a real plus. Third bedroom a full plus a trundle. A short walk to the beach and beautiful sunsets seen right from the lanai. Owners easy to communicate with and very responsive. Would definitely stay here again with a big group! So glad to have found this 3 bedroom for a few nights with my sister's family. 4 adults and 4 kids. Plenty of room for all of us. The 4 kids just loved the bunk bedroom! The unit looks just like the picture. It isn't super fancy, but it was very clean and comfortable. We liked the all tiled floors, and the granite counter tops in the kitchen. We also enjoyed the beach chairs, boogie boards, and toys in the patio closet. The location is super great! We were able to walk with the kids to the sandy beaches, coffee shop, and a number of restaurants. If we were to visit Maui with extended family, we would stay here again. Loved the Kama’ole Sands, this condo was not the best. This condo is spacious and the ground floor location is great. Overall the condo is well worn, however it was clean throughout. The en-suite bathroom needs an upgrade, at the very least a new vanity. We did find that this condo was not as well supplied as others we have stayed in. Kitchen utensils and knives are well worn and the tea towels and dishcloths need to be replaced. The patio furniture was ricketty to say the least and has seen better days. There was a sufficient number of beach chairs however at least 3 of them need to be replaced and the beach umbrellas were not good. Overall this condo needs some TLC and general upgrading. Glad that you enjoyed the resort, and thank you for your feedback. I have forwarded this feedback to our property management company on Maui. I have asked them to conduct a through unit inspection, and to toss out and replace any worn/damaged items in the entire unit. We always do our best to ensure our condo is well stocked for guest comfort, and beach outing needs. We came to Maui for a two week stay for a family wedding and the place worked out well. Two families with one child and an infant had more than enough room. We could have fit 2 more children easily. The beach supplies were well equipped with chairs, towels, umbrellas, and other accessories. The kitchen is dated but functional. There was limited room for all the food for the crew but we made do. The oven and dishwasher were super handy. The pool at the complex was pretty cool as the weather for the first few days was not very hot. The people at check in were very friendly and helpful. The beach out front was well used by us. The shops are walkable but not super close. Overall it was a good stay and the unit was exactly what it looked to be. spacious 3 bedroom great for families. two decks but very tiny facing street.Complex in Good location. Unit was clean,beds comfortable. Lots of beach equipment. Main bath need some attention as main valve in shower dripping therefore causing mold issue. Easy check in. We are glad that you enjoyed your stay with us, and we appreciate your feedback. We have notified our property manager on Maui about the water leak in the shower, and it has been promptly fixed and cleaned. I would like to make a clarification about the lanai. The lanais do not face any street, as the building is set back away from the Kihei Road. The lanais are back against another complex, and face that building's parking area, but the two complexes are separate by a fence, with a line of tall tropical bushes/trees between the two complexes. Please see our photos. The lanais are of standard size, and are comparable to most of the other units' lanais in the complex. Our unit is one of the very few that has two lanais. One off of the living room, the other off of one of the bedrooms. Both offer partial views of the ocean. The lanais are also further extended by a grassy area lawn that feels very private. Our condo is across the street from a nice sandy beach, and within walking distance to several restaurants. There is an one-time resort fee of $35, plus tax, payable directly to the resort upon checkin.